After a year’s worth of work, Grand Valley State University’s student journal of art and writing, Fishladder, released its 15th edition to a crowd of contributors, editors and guests Friday, April 13. 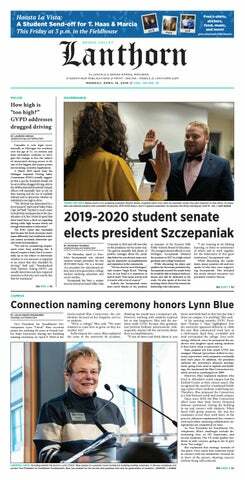 The journal, which features fiction and nonfiction writing, poetry, art and photography, was formally released to the public during its annual unveiling event. Fishladder Editors-in-Chief Chiara Licari and Kathryn Davis revealed the journal together alongside Assistant Editor Maria McKee to a crowd of fellow editors, guests and students who submitted work. Licari said releasing the journal to the public at the unveiling event is a point of finality for the Fishladder staff. During the event, featured journal contributors presented their work to the crowd, including Schyler Perkins, who read his nonfiction piece titled “Alcoholism and Oil Deficiencies, or Hydrocarbons: An Essay About Breaking Down." Perkins said despite his fear of reading his piece aloud, it was exciting to finally have his work published and shared. For staff members like Assistant Nonfiction Editor Nick Kondyles, the reveal was their first time seeing the aesthetic of the journal. Davis said after sorting through hundreds of submissions, editing work and designing the journal throughout the year, she was most excited to continue to surprise readers. Last year, Fishladder made a shift from a rectangular journal to a square one sporting a minimalist cover, but this year, Davis is primarily excited about the prowess of this issue’s writers. That quality is achieved through a diverse cast of contributors, Davis said. The product of their creative efforts is best seen through both the turnout of the unveiling ceremony and the skilled writing and art within the journal, she said. A goal of the Fishladder team is to raise awareness of the publication within the community. With some form of name recognition already established, Davis said, the next step is to have readers understand that the journal is full of rich, inspiring writing. With Davis and Licari both graduating, the duo said releasing the journal at the event came with the realization that their time at GVSU was coming to a close. Despite no longer being part of the publication, Davis said seeing the support and pride in the faces of those who attended the unveiling was inspiring. “(Fishladder) is a really great platform for students to share their voices and their stories," Licari said. "It’s a great honor to be able to publish something like that." Copies of Fishladder can be picked up in Lake Ontario Hall, Room 326.